A new study by iSeeCars.com on when to find a good deal on a used car revealed some surprising results. The study showed that the top 10 best and worst times to find a deal were dominated by holidays. Months toward the end of the year such as November and December, often touted as a great time to get a car deal, were not as good as many holidays. "It's always nice to save money, and when you are buying something as expensive as a car, saving even five percent of your purchase, or $952 off the average price of $19,040, can really add up," said Phong Ly, iSeeCars.com CEO. 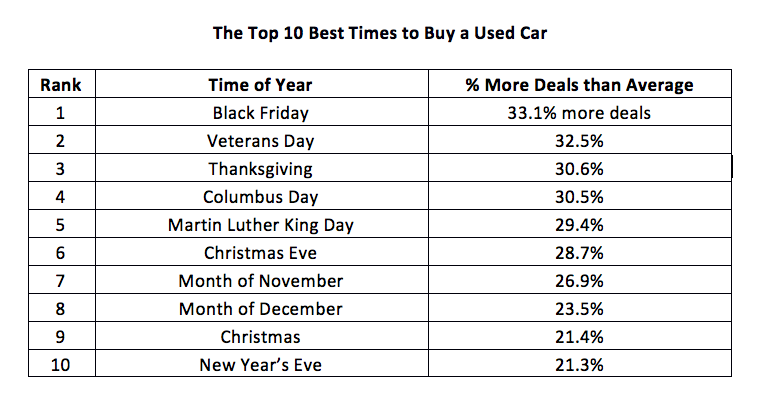 "But it's hard to get the savings if you can't find the car you want, so we assessed which times of the year had the greatest number of deals." Overall, the best holidays to buy a used car are those surrounding federal and retail holidays, all clustered in the late fall and winter months. Many of these holidays offered substantially more deals than average. Black Friday, a major shopping holiday, took the top ranking as the best holiday to get a deal. But unexpectedly some holidays that aren't considered major shopping holidays like Veteran's Day, Columbus Day and Martin Luther King Day, all ranked in the top five nationwide. "While these holidays aren't typically thought of as major retail days, dealers tend to make a big push to boost sales in the late fall and early winter by offering bigger deals and these holidays are a great reason for them to pump up their promotions — especially as two of the three are always observed on a Monday, which means shoppers have a long weekend to find the car they want to purchase," said Ly. 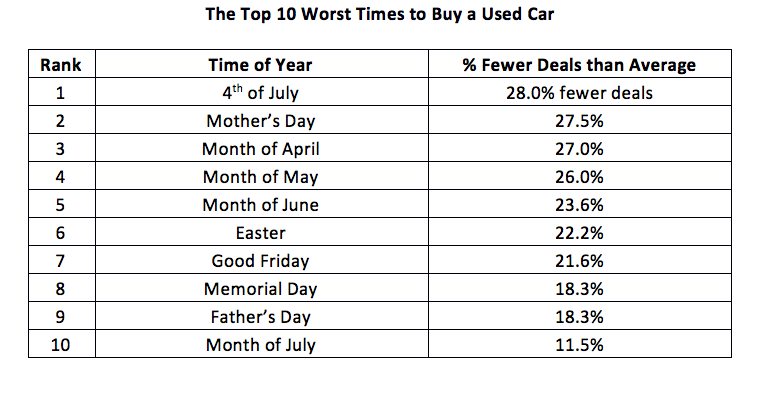 More surprising was that 4th of July, a major holiday, was the worst holiday and the worst time of the year to buy a used car, with 28 percent fewer deals than average. Memorial Day also had fewer deals. These holidays occur in the late spring and summer months which proved to be among the worst times to find a deal. Ly explained, "This is the typical time of year when dealers see higher demand, and therefore less of a need to drive sales through lower pricing. After the current new car model year comes to a close around August, consumers start trading in their used cars in higher quantities, thereby increasing the number of used cars available after the summer and driving dealers to make better deals." With so many late fall and winter holidays offering the best chances for a deal, it's no surprise that those same months proved to be the best months to get a deal on a used car. November ranked first overall with a 26.9 percent more deals than average, followed by December (23.5%), January (16.4%), October (12.8%) and February (6.0%). "Between year-end promotions and dealers' scrambling to take advantage of the last few months of the year to meet their sales quotas," Ly noted, "the conventional wisdom of shopping for a car at the end of the year holds true, though there are some holidays that are better times." The five-month stretch from April through August was the worst for finding deals, with 27.0 percent to 10.2 percent fewer deals than average. For shoppers who can't wait until the end of the year, the first day of the month is a better time to find deals than the end of the month: the first day of the month is 8.5% better than average while the last day of the month is just slightly lower at 5.6% greater than average. This difference can be explained by how the sales period lines up with the calendar month. “The dealership's sales month usually ends a few days into the beginning of the next calendar month,” said Ly, “so sales made on the first of the month, for example, get tallied into the previous month's sales.” Consequently the first day of the month was the best day for deals. “Much like with the end of the year, dealers are probably trying to make some last-minute sales to meet their monthly goals,” explained Ly. Similarly, the fifth day of the month was the worst day for deals, most likely because it is always at the beginning of the new sales period. Shopping for cars on weekdays is commonly thought to be better than weekends because foot traffic is lower on the weekdays, and therefore dealers discount more cars to drive demand. While the iSeeCars.com study shows that weekdays are indeed better than weekends, they are not much better. Weekdays have only 1.2% more deals than average while weekends offer just 1.6% fewer deals. Taking all these considerations into account, consumers who are planning on buying a used car later this year could be exceptionally well poised for saving money. Ly said, "With over three million cars expected to come off-lease this year, the used car inventory will grow, making it ripe for dealers anxious to move the cars off their lots." iSeeCars.com analyzed over 40 million used car sales from 2013 through 2015. Deals were identified based on whether the car was listed at five percent or more below market value. The total number of listings and number of deals were aggregated nationally at several timescales: by month, day of the month, and day of the week. In addition, the data were also aggregated for specific holidays. At each aggregated timescale, the number of deals were divided by the number of cars sold, resulting in a probability of finding a deal. These resulting probabilities were expressed as a percentage difference from the overall probability of finding a deal on average day (19.5 percent). iSeeCars.com is an automotive data and research company that helps consumers find the best car deals by providing key insights and guidance. It turns used and new car shopping on its head by applying Big Data analytics powered by over 25 billion (and growing) data points and using proprietary algorithms to objectively analyze, score, and rank millions of cars and tens of thousands of dealers. 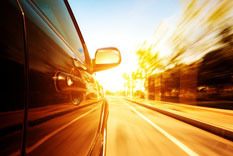 Based in the Boston area, iSeeCars.com was founded by former TripAdvisor and SAP developers and executives determined to improve the car shopping experience for consumers.